The objective of the Summer School is to contribute to the development of quality lifelong learning in the EU, to promote high performance, innovation and a European dimension in systems and practices in the field, to help promote creativity, competitiveness, employability and the growth of an entrepreneurial spirit and to diffuse European values and concepts among students coming from all over Europe and beyond. 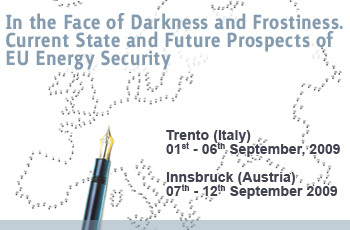 In particular, this Summer School will concentrate on European energy security policies, renewable energies and environmental sustainability, in order to raise awareness in the participants that these dynamics lead towards a gradual and differentiated diffusion and penetration in different territorial contexts of values, principles, norms and strategies. Energy issues represent a challenge for European Union, in terms of geopolitical national and super-national interests, cooperation among EU and extra-EU areas, global warming and sustainable development perspective.